If you own an Xbox 360 and you have it connected to your home network, you should definitely take a look at Connect360 from Nullriver Software. This $20 software makes it possible to stream all of your Mac’s (unprotected) audio, video and photos to the Xbox 360. Not all of us Mac users have or even want an Apple TV, but many of us have invested in video game consoles to feed our gaming jones. The Xbox 360 is very popular with Mac users, and it’s easy to understand why—there’s a ton of great content. But the Xbox 360 is more than just a gaming machine—it can also play movies, music and view photos on your TV, and it can even connect to a computer, just like an Apple TV. Microsoft, like Apple, is more focused on making its own hardware work well with its software, so it’s no surprise that out of the box, the Xbox 360 can’t communicate with the Mac. But it’s a lead-pipe cinch to connect the device to a PC running Windows Media Center, Windows XP, or even Vista; this is where Connect360 comes into play. The software makes your Mac’s media files accessible to the Xbox 360 the same way. Connect360 installs on the Mac as a system preference pane, and it’s very easy to use. Once it’s installed you’ll see it in your Mac’s menu bar, and that menu bar item lets you share or unshare your photo library, iTunes media library and movies folder, respectively. The Connect360 controls show up in your system preferences and provide you with simple access to the software’s features. Media Center The Connect360 controls show up in your system preferences and provide you with simple access to the software’s features. Options let you tell Connect360 where your movies are kept (if not in the movie folder) and what quality setting to use for image transcoding. You also get to pick from some basic options on your iTunes library as well, such as whether to share audio and video podcasts. Once Connect360 identifies your Xbox 360 on the network, it will automatically connect to it. 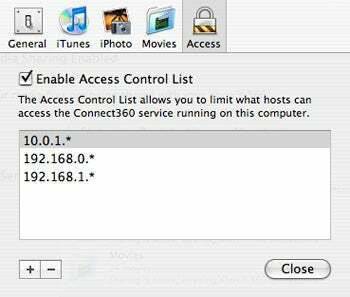 Nullriver has also included an optional Access Control List, which lets you limit what devices can access the Connect360 service running on your Mac. This is particularly helpful for college students, for example, who want to keep hackers on the same local network away from the contents of their Macs. Connect360 lets you access playlists you’ve created in iTunes on your Mac as well, so you have a fine degree of control over what you’re listening to. You can also listen to Internet radio stations you’ve marked in iTunes. 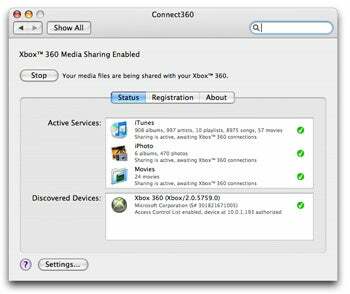 All of the music, video, and photos you’re sharing on your Mac are streamed to the Xbox 360, similar to the way a guest Mac or PC works with the Apple TV. So none of your Xbox 360’s hard disk space is wasted storing these files. That means you’ll need a live connection to your Mac in order to use them, obviously—if the Mac goes to sleep or is shut down, you won’t have any luck playing your content. The software’s access control list lets you keep prying eyes away from your Mac. Gatekeeper The software’s access control list lets you keep prying eyes away from your Mac. Connect360 works with quite a few different audio and video formats (including WMV if you have Flip4Mac installed), but content encrypted with FairPlay Digital Rights Management (DRM) software is strictly verboten. For that, you’ll need an Apple TV. Attempting to play a protected audio or video track will pop up a message on the Xbox 360 that that file format isn’t supported. The quality of video streamed to the Xbox 360 is excellent; of course, that entirely depends on how it’s ripped on your Mac. As FairPlay-encrypted content is off limits, it’s entirely up to you as to how good things look, because you’ll end up using tools like Handbrake, Techspansion’s VisualHub or Roxio’s Crunch to prepare it for playback. Content that you may have optimized for playback on an iPod is going to look grainy, but anything made for optimal playback on an Apple TV or using an Apple TV preset will look fantastic even on big televisions. A button in Connect360 links you to a Microsoft support page that explains what video modes the Xbox 360 supports. One option in particular—“Disable system sleep while Connect360 is active”—seems to be particularly important. I discovered that if the Mac goes to sleep while it’s connected to the Xbox 360, the Xbox 360 has a difficult time re-establishing a connection until the Mac is restarted. I tried restarting the Connect 360 software to no avail (Nullriver support said that should have worked). Nullriver’s products are developed to be dead simple to use (their slogan is “Intuitive Software, Intuitive Design”), so it’s perhaps understandable that they’d restrict support to an online FAQ and an e-mail form, but it’s often helpful to be able to communicate with other users to trade information, and Nullriver doesn’t have any visible support forum. Its e-mail support is pretty good, however—I even got a response from the company on a weekend. Earlier versions of Connect360 had problems with streaming dropouts; that’s been fixed with version 3.1. It appears to be doing a fair amount of buffering, which makes navigation somewhat clunky if you’re on a slower Mac, a congested network, or if you’re using an older wireless network interface to connect your 360. (The most recent model from Microsoft supports 802.11g, so it’s reasonably fast). There’s no way to copy the music and video from your Mac to the Xbox 360, but this isn’t a flaw of Connect 360—this is by design of Microsoft, which wants you either to rip music straight from a CD or buy (or rent) movies from Xbox Live and download them. If you have an Xbox 360 and you’re not using an Apple TV, Connect360 is certainly worth the money—it helps integrate your Mac and your Xbox 360 as centerpieces of your digital media center.